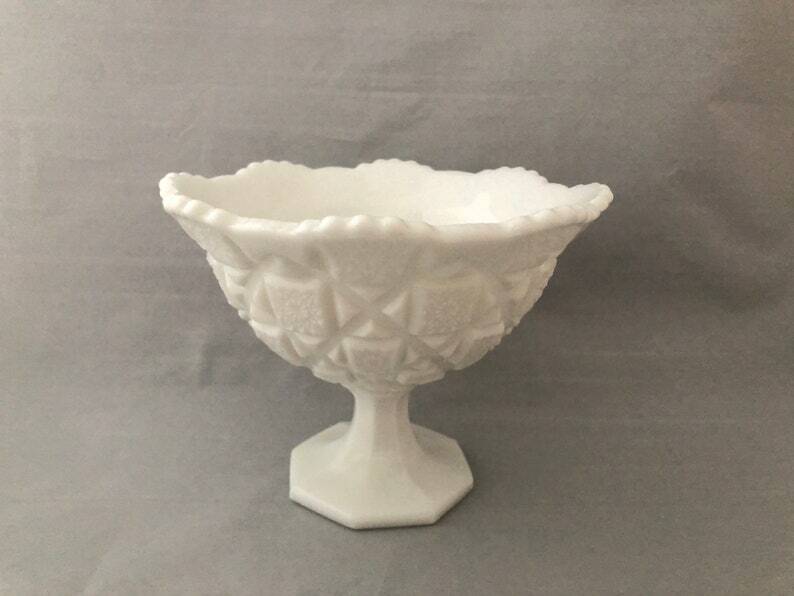 Made of the beautiful milk glass that was primarily responsible for making Westmoreland's fine reputation in the American glass making industry for close to 100 years, this piece is a fine example of its kind. And although many pieces by Westmoreland are not marked, this one clearly displays the stacked W and G embossed on its bottom. This is a lovely large dish that, with the use of a vintage glass "flower frog" or some modern florist putty to hold the flowers upright, would make a perfect centerpiece for the dinner table or console table, or display bowl for fruit, or serving dish for candy. The Westmoreland classic Old Quilt pattern on this dish features alternating triangles and squares with a fancy star design. The bowl also features an intricate and attractive scalloped rim. At approx 6” tall x 7.5”wide with a nice depth to its bowl it is a practical and attractive size for all the uses described above. And it is a beloved Americana collectible that can warm your home with tradition as well as beauty, and be passed down with the story of a fine American tradition dating to the mid 20th century. Excellent condition --- no damage or visible evidence of use. Ready for your home or to give as a gift.